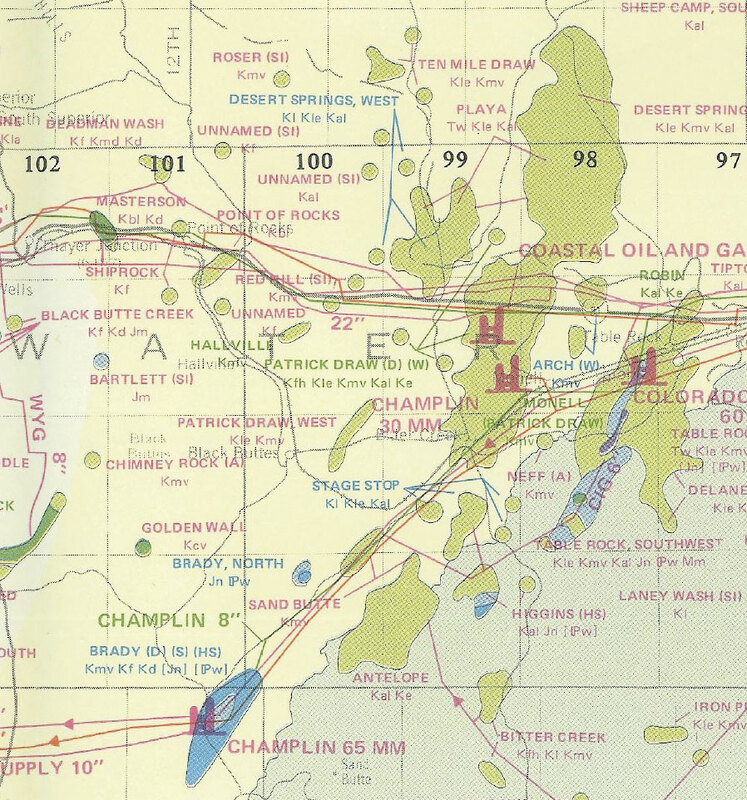 The Wyoming State Geological Survey has published maps of Wyoming's oil and gas field locations since 1972. This one is from 1984. As one of the United States' top oil- and gas-producing states, Wyoming relies heavily on geological data, which needs to be current and organized. The Wyoming State Geological Survey (WSGS)—which promotes the beneficial and environmentally sound use of geologic, mineral, and energy resources—has published regularly updated maps of oil and gas field locations since 1972. This series of maps is popular with industry professionals and local governments, as well as the general public. 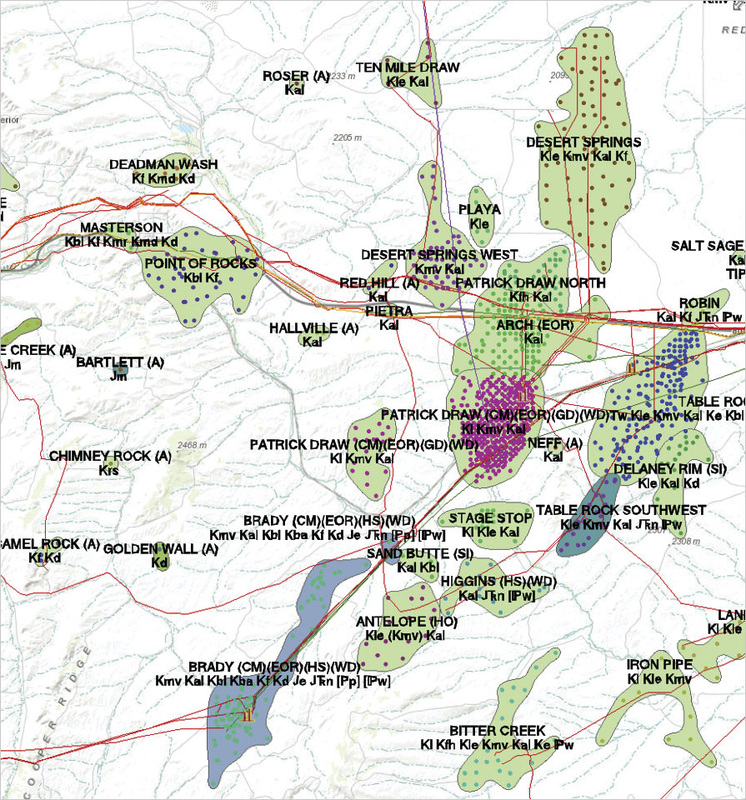 Over the last few decades, Wyoming's oil and gas data has moved out of filing cabinets and into digital databases; what used to be presented as lithographic maps has now become interactive with GIS. Yet, even with the transition to digital records and methods, WSGS's veteran geologists were still drawing the state's oil and gas field delineations by hand. As these highly skilled geologists began to retire, however, the organization needed a new way to produce its map series. So WSGS turned to the ArcGIS platform. To begin the process of updating the map, WSGS obtains the basic oil and gas well data from state permitting agencies. It then rigorously screens the data and prepares it to be mapped, calculating associated statistics and attributes such as primary production type, the production age of reservoirs, and the total number of wells. In the past, this process was undocumented, so only those who had authored previous maps knew how to screen and prepare the data. Figuring out why certain wells were assigned to a particular field or excluded from another was difficult—and sometimes impossible. 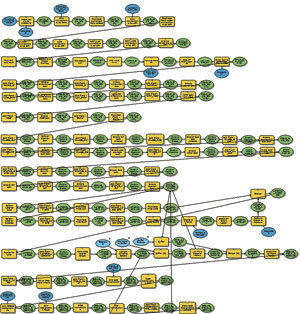 This time around, however, WSGS used ModelBuilder to put together an extensive, 223-element model diagram that makes any needed corrections to the data before screening, attributing, and aggregating it. The model then identifies wells whose attributes (well status, class, production history, etc.) need to be checked for accuracy. WSGS used ModelBuilder to create two data models that quickly process and draw Wyoming's nearly 1,400 oil and gas fields. The information kept in this digital record can be quickly accessed and easily replicated. The diagram has eliminated a considerable amount of human error as well. And it allows WSGS to share its log of data updates with permitting agencies, which not only enhances the agencies' data but also makes it possible to streamline future updates. After screening and preparing the oil and gas well data, the next step is to map it. At the most basic level, this entails clumping together collections of spatially and characteristically similar oil and/or gas wells to create fields. WSGS then relates its fields to the field names that other organizations use to assign permits and track production. Being able to document the spatial extent of the fields is also important for comparing and analyzing geologic patterns, so representing them correctly is important. Due to their popularity, paper maps of Wyoming's oil and gas fields are still being produced by WSGS. But polygons on paper maps can only express a limited amount of information about each field. Thanks to the data model, WSGS now has several dozen additional classes of information (such as field status, well type, and drilling direction) about each fossil fuel-producing unit. So this time, the organization also created a map in ArcGIS Online that allows interested users to dig down into a much greater pool of information about each oil and gas field and its associated wells. The most difficult part of mapping Wyoming's oil and gas fields is automatically generating polygons that accurately represent the data but also resemble the hand-drawn aesthetic of WSGS's time-honored map series. Following extensive testing of the polygon tool parameters, WSGS used ModelBuilder to develop another data model that helps mapmakers emulate the traditional look of the paper maps while also preserving all the data. This iterative cartographic model, which has 62 elements, uses multiple levels of buffering, aggregation, simplification, smoothing, clipping, and querying to generate an exceptional representation of nearly 1,400 named oil and gas fields in Wyoming—and no manual intervention is necessary. In most cases, the fields look better than in previous map versions that were digitized at a variety of scales. That is because, unlike the old hand-drawn maps that varied—even slightly—depending on who drew them, the model produces the same result each time until the underlying data is updated. Using the model makes the whole process a lot less time-consuming as well. With its new data models, WSGS can update its map of oil and gas fields in just a few weeks, and the map can be uploaded to a web-based interface for easy distribution. Revamping how WSGS screens its oil and gas data took a few months, and setting up and testing the two models required several more months of work. 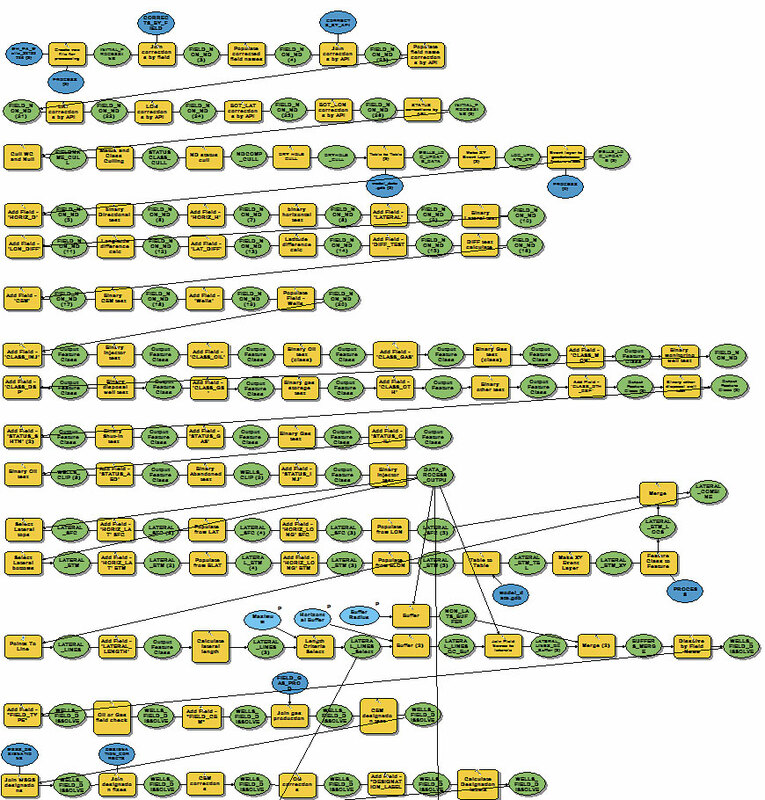 But now, the organization has all the preliminary data work saved internally in the data models. Thus, the groundwork has been laid for future updates, and the process is now mostly automated. Unlike before, oil and gas well characteristics that have been checked once won't need to be analyzed each time. And when the map series is updated, only new wells that have been permitted since the previous iteration will need to be examined. This immensely reduces the number of data points that have to be checked. Previously, the map of Wyoming's oil and gas fields was only updated every three to six years because of how much time the project required. Even after regulators made the basic well data available online and ArcGIS enabled WSGS to accurately map spatial data in a timely manner, it still took two WSGS employees almost a year to update the map because of all the redundant plotting, drawing, scanning, georeferencing, and digitizing they had to do. With its new models and digital methods, however, WSGS can now update the oil and gas field map in just a few weeks, which means the map series can be updated every other year. What's more, the map can instantly be uploaded to ArcGIS Online for easy and quick distribution. "WSGS's ArcGIS Online map allows users to create their own customized experience through the tools provided by the web map," said WSGS director Tom Drean. "Users can view only those layers they are interested in, zoom in to a specific location, search for user-defined datasets, create simple charts, measure distances and/or locations, view more detailed layer attributes, change the basemap, and print a simple screen shot of their map." This greatly enhances WSGS's ability to fulfill its mission of advocating the favorable and environmentally conscious use of Wyoming's natural resources, which benefits all the state's residents. Jim Stafford, GISP, is a natural resource analyst at WSGS, and Rachel Toner and Ranie Lynds are both oil and gas professional geologists there. For more information on this project, email Stafford or Toner. Additional details, including the Interactive Oil and Gas Map of Wyoming, can also be found at wsgs.wyo.gov.